It really is a small world. Seriously. There are closet car builders hiding everywhere. Your neighbour might be one. Since I started this site and posting on the Cobra Club forum I've been surprised by how many people are not only building a car, but how many others have a friend who've built one or are in the process of building one and how many are near me. Tonight, for example, I was in Ford's picking up some new bolts for the driveshafts and trying to order some locknuts for the track rod ends. Me - "It's for a Sierra steering rack"
Ford guy - "What year and engine size?" Me - "Um..not sure, mid 80s maybe?" Ford guy - "Hmm. Is it for a kit car?" Ford guy - "What sort?" Ford guy - "Nice, I've built a Dax with a V12 Jaguar engine"
Me - "V12?!!! Bugger me!" The new bolts and accompanying washers were taken back to the garage ready to help fit the rear suspension together. But before I get to that, let me fill you in on progress over the last couple of weeks. Some friends came down for the weekend and helped mount the rear swing arms which was quite tricky, but made all the easier with 3 pairs of hands. No major dramas, just the fiddle of raising/lowering the jack by a millimeter at a time to line up the holes and the bolts. After we were done doing that, I was keen to bolt the suspension struts to the lower arms and at this point I couldn't find the right bolts. I could have sworn I'd spotted them a couple of weeks ago and put them to one side, but we looked everywhere without success. After a while it dawned on me that the bolts holding the diff to the chassis at the back were exactly the right size, but surely they were needed for the diff?? So that was as far as we could go. I called Pilgrim during the week and Penny sent me the nut and bolt list that I should have got with the pack (but didn't). It showed how many of each size I should have and more importantly - which bits of the car they are used on (would have been helpful to have this about 2 months ago!!). Anyway, it turned out I had used the wrong ones for the diff - despite the holes being a perfect 10mm, you actually need to use 8mm bolts. Penny said she'd heard of people making this mistake before, perhaps a small revision to the build manual should be suggested here! After taking the offending bolts off the diff I thought I would have a go at changing the oil as I hadn't remembered to do it before mounting it. Simple I thought, unbolt the back end and top and let the diff swing down supported only at the front to allow the oil to drain out. Not so - turns out there's not enough room to swing the diff down, so I undid the front bolts and took the whole unit out, leaving the carrier bracket on the chassis (I wasn't about to try playing with that again). Black gunk out, fresh (disgusting smelling) clear oil back in and I remounted the diff (with the right bolts), which was extremely difficult with one person, but not as hard as the first effort with the carrier as well. And suddenly that was last weekend gone. All I had acheived in a week was changing some oil. Not good progress! In an effort to make up some time I spent most of this evening finally finishing the rear end. 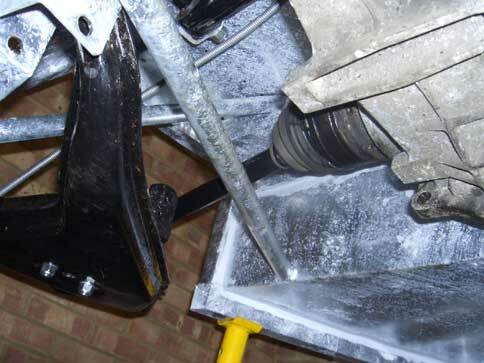 My first efforts were hampered by the suspension struts - with them bolted to the chassis at the top (as specified in the manual), when the rear arm was brought up to meet them the angle they sat at meant I couldn't get either a spanner or a socket onto the top of the bolts needed to attach it to the rear arm. Scratching of head and I decided to unbolt the struts from the chassis, bolt them to the arms then bolt them back to the chassis. 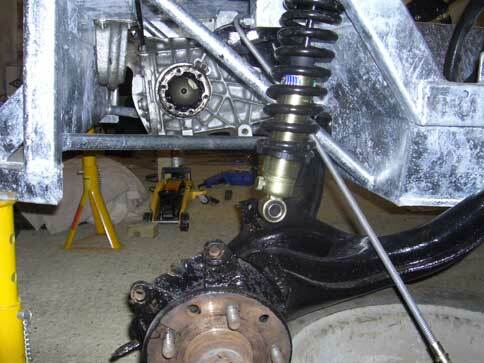 First, though I had to bolt the drive shafts to the differential. The Granda set up uses CV joints bolted to the diff and hubs. Unlike the Sierra setup where you can slide the shafts in after the rear arms and struts are bolted together, you kind of have to do boths things at once. Fiddly, but not difficult and now the rear end is finally together. Just need to properly torque all the bolts when the car is on the ground (which won't be long hopefully!!). 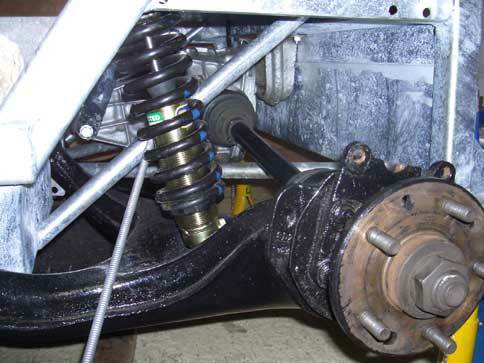 I've ordered the bits to make the brake pipes and fuel lines along with the bolts for the steering rack to replace the ones I stripped putting the bushes in the wishbones. They should all arrive tomorrow with any luck. Then I need to mount the steering rack, re-taper the front uprights and put the steering column together and I will be able to put the wheels on and "drive" it about!